Adobe Photoshop Elements has been part of my photographic workflow for more than a decade. It’s always been my go-to software for adjusting and improving my photos. 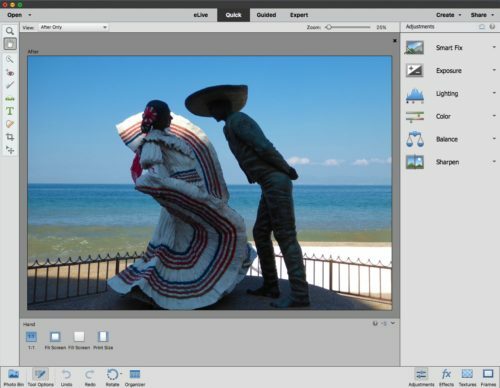 Photoshop Elements (PSE) has been on an annual incremental upgrade path for several years, pushing out new and enhanced features with each release. The new Elements 15 is no exception. Adobe’s Bob Gager states that their objective is to make the software do the work so you don’t have to. When you open the Editor in Elements, you can choose from three skill levels: Quick, Guided, and Expert. The Quick level is mostly a collection of one-click improvement filters. They are useful and if you are in a hurry to touch up a large group of photos to share with friends, these work well. The Guided level presents you with much finer adjustments including Levels, Shadow/Highlight adjustments, Rotate/Straighten, and many others. The Expert level gives you the ultimate in granular control similar to full Photoshop Creative Cloud (CC). You choose the level with which you are most comfortable. As you become familiar with the tools and features you can work your way up to more complex, but more professional results. This time around, as in the past, many of the familiar editing features have been enhanced. There are several new additions that include collage creation, painterly effects, motion blur effects, and creating typography where the letterforms contain photos. (Remember those souvenir postcards from Niagara Falls?) Scrapbookers will love the frame creation features. The Organizer is improved so that searching by keyword tags, people, places, events, and more has become easier. 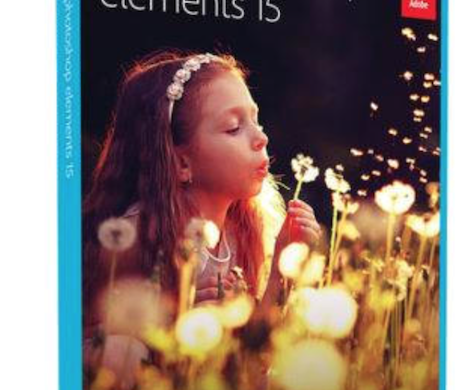 Elements 15 includes ninety-nine filters. Some of them have recently been brought over from Photoshop. Improved haze removal is a useful landscape tool. There is a new facial feature adjustment that acts like a warp mesh control. You can stretch and pinch facial areas, turning a frown into a smile for instance. It’s a little creepy, but if used with restraint, it works surprisingly well. Photoshop Elements 15 is a must-have photo manipulation and enhancement app. There are many training-wheels features for newbies that I don’t use, but they serve their purpose for those who need them. Note: Most of Adobe’s photography products are now sold on a monthly subscription basis. Elements is still a stand-alone application that you purchase once. But if you upgrade every year at $80.00, that’s roughly the same as paying $7.00 per month. It’s not exactly a subscription, but if you buy the latest version each year as I do, it’s close. PSE remains easier to learn and use than professional CC Photoshop. 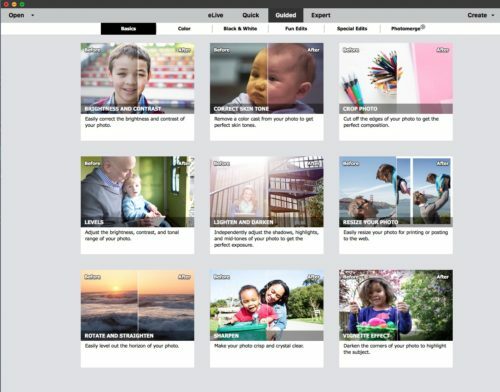 If you prefer not to pay for a software subscription like Adobe’s Photography Plan (which includes Adobe Photoshop Lightroom CC and Photoshop CC for $9.99/month), Photoshop Elements 15 is a good starter kit for every photographer. 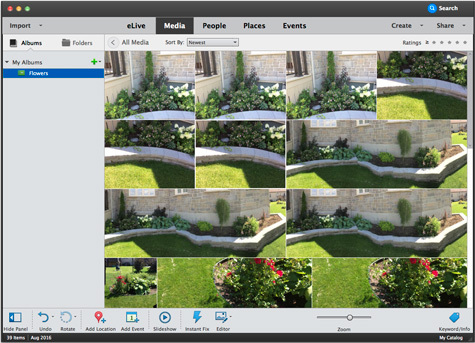 PSE includes both a photos organizer and a photo editor for a very decent price. When you purchase the physical software or the download, you have two licenses for two of your different computers. The Elements Organizer is basically doing the same thing as the Lightroom Library module. It permits people to organize your library by folders or by albums (equivalent to Lightroom’s collections). When you launch the Organizer for the first time it will ask you to import your images from your internal drive and start analyzing your images for faces. This process is relatively tedious on the CPU, and you have to be patient before using it decently, or you can simply disable it from the preferences. The set of features is not as impressive as Lightroom itself, but will satisfy peoples unhappy with new Apple’s Photos app for Mac. If this Organizer is not enough for you, Lightroom is probably the next best solution for both Windows and Mac users. After the Elements Organizer database has been built, if you launch Lightroom you will be asked if you want to import this catalog into Lightroom. If you are migrating from the Organizer to Lightroom, it is nice to know your organization will be intact. If you already use Lightroom, you can disregard the Elements Organizer all together. 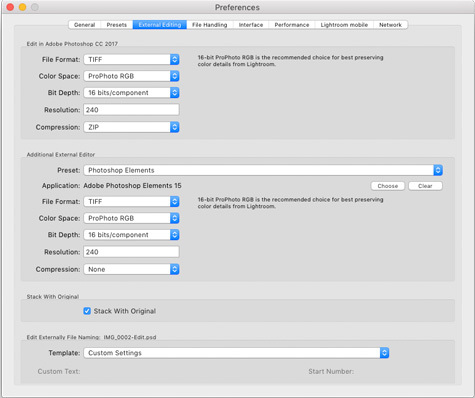 For people who want to buy the standalone version of Lightroom (one time fee of $150) as their main organizer and for the develop features it offers, Photoshop Elements Editor is a great external editor for advanced tasks. The Editor offers most of the commonly used features of its grand-brother Photoshop CC. In the Expert mode you get layers with their expected adjustment layers, masks, and groups. A good set of selection tools is also available; they are very efficient, and you still get the Refine Edge and Feather features. The tools on the left have different icons, and they are a subset of the full CC version, but what you don’t get is are more specialized tools or less used. The tool options are at the bottom of the picture instead of the top, sharing space with the photo bin, and we get use to it pretty fast. As you may guess, PSE is missing some of the professional features of the subscription Photoshop CC. Nothing that is very necessary for amateur photographers. On the other end, Photoshop CC has many legacy features that may not even be used today by most pros, but are kept there for compatibility. 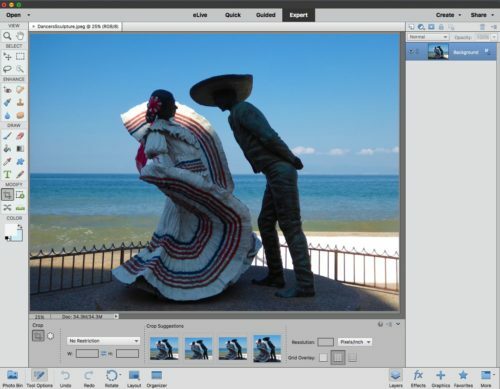 For most photographers, PSE means a simpler full featured editing software. 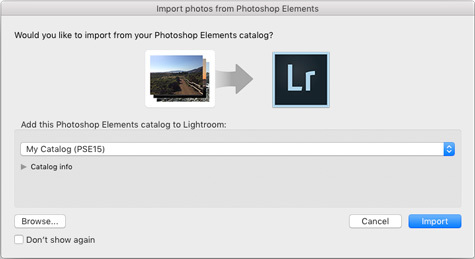 Note: Because Photoshop CC and Photoshop Elements are developed by Adobe, jumping into Photoshop Elements 15 as an external editor to Lightroom or the Organizer is very easy. You feel at home very quickly, and it provides an even simpler interface. There are even some extra features such as a way to print CD/DVD jackets and labels, Facebook covers, greeting cards, books, calendars and collages. It would have been interesting to have a better integration with Lightroom for these features. I was concerned about newbies and amateur photographers installing and running PSE 15 on older and slower Macs. Not to worry! I have been doing advanced photo enhancement on an underpowered 13 inch MacBook Pro with a client and she is delighted at Elements’ speed and efficiency. Installation was quick (hooray), launching from the dock takes a reasonable amount of time, and most edits happen swiftly. 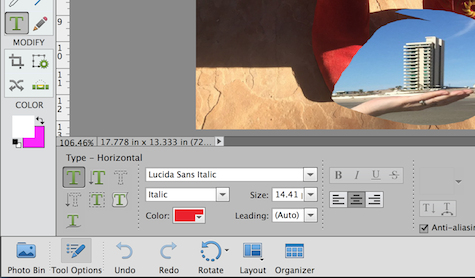 It is confusing having the Photo Bin and the Tool Options occupy the same location at the bottom of the screen, but that’s Adobe’s decision and we can learn to live with it. There are a few persistent minor interface annoyances that I have mentioned to Adobe over the years, and I can accept that the company prefers to move forward with new features. I have used Adobe Photoshop Elements since version 1. I have taught it in large and small workshops since version 2, including a monthly Digital Dames group that has been meeting monthly for 14 years! The PSE Editor is some of the most successful and satisfying software ever. Well done, Adobe, continuing the excellence in version 15.